It's always fun coming across music directors and playback singers I haven't heard before. As much as I love the blog's mainstays it's kind of refreshing with the odd break from all the usual suspects. I know very little about who Ramlal (Choudhary) is or was other than that his Bollywood career only seems to have lasted a few films. 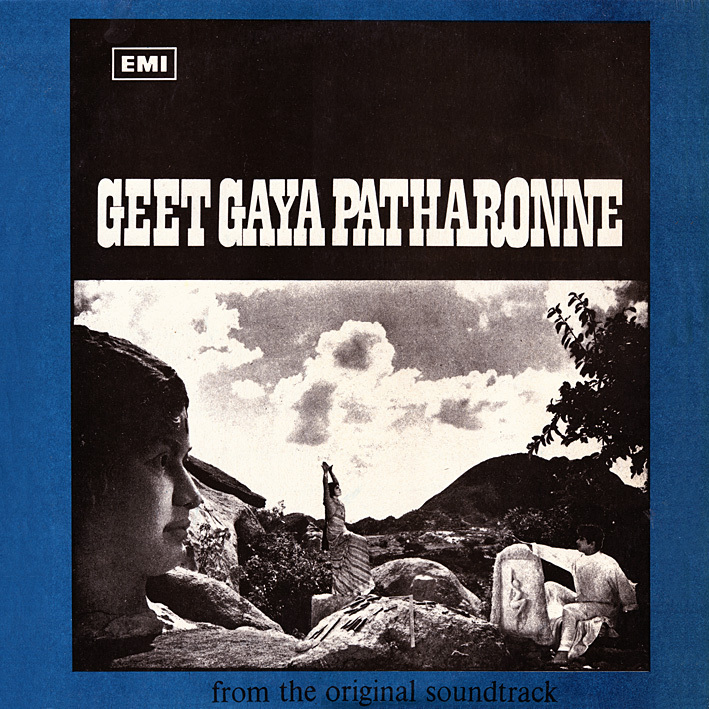 His score for 'Geet Gaya Patharonne' is traditional all the way through, and while it perhaps doesn't grab me as a whole the same way the previous post did, it certainly has its share of notable moments. I'm very enamoured with C.H. Matma's soulful 'Mundve Tale Garib Ke'. Driven by a harmonium (possibly played by the singer himself) and rhythmically unconventional, it's unlike most other Indian film songs. 'Tere Khayalon Me Hum' is a quite unbelievably stunning piece; dreamy, atmospheric, a thing of great beauty. Lata Mangeshkar usually sings these, but younger sister Asha does a wonderful job here. The lovely 'Aaja Jaane Ja Mere Meherban' features a very peculiar drill-like noise in addition to a wobbly clarinet, augmenting a charmingly old-fashioned sounding melody. And finally, the second version of the title tune is enchanting. It was classical singer Kishori Amonkar's sole venture into film music; her delivery is impeccable but she apparently disliked the industry too much to keep at it. I absolutely adore the choreography in the film sequence. Definitely worth checking out, this one. That's my favourite song from this too. And the picturization is gorgeous! P.C Thanks for the great sound track. There is one more C H Atma track in the movie "Ek Pal Jo Mila Hai Tujh Ko". Cool, thanks. The internet isn't very clear in regards to him either; some places refer to him as Chandru Atma, while others claim that Chandru and C.H. were brothers. Thanks for the great stuff as always. Try Sehra by Ramlal.. you'll love the sound. I'll keep an eye/ear out for it.